The Sons of the Harpy is an underground insurgency group composed of former slaves who are fighting the rule of Daenerys Targaryen over Meereen, composed of former slavers. They take their name from the harpy, the heraldic symbol of the slave masters in the Ghiscari cities of Slaver's Bay. They conceal their identities by wearing golden masks with horned faces resembling harpies. 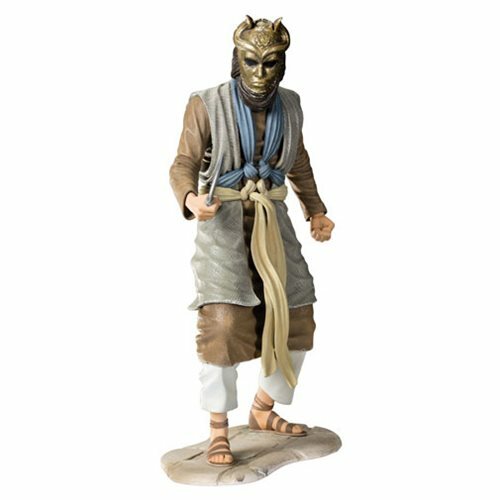 Don't miss this highly detailed Game of Thrones Son of the Harpy Figure, which comes complete with display base, a knife, and a gorgeous costume complete with awesome mask! Measures approximately 7-inches tall. Ages 14 and up.